A state-of-the-art telescope array with the apt acronym VERITAS (the mythical goddess of truth) and located at the Fred Lawrence Whipple Observatory in southern Arizona has been seeking the truth about a mystery that has puzzled scientists for nearly 100 years: the origin of cosmic rays. 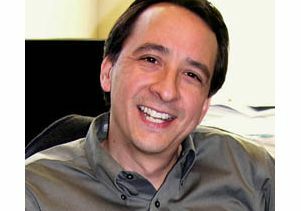 UCLA Professor of Physics Rene Ong and his colleagues built several of the telescope array's electronic components,developed much of the software for the project and manage all the data in a huge archive here on campus. Now, recent results presented by VERITAS (Very Energetic Radiation Imaging Telescope Array System) have provided evidence to support a long-held theory — that cosmic rays are formed by exploding stars and stellar “winds.” The findings were published in the Nov. 1 online issue of the journal Nature. “Cosmic rays cause outages of cell phones and satellites and things like that, and they’re an important source of energy and particles in our galaxy,” said Rene Ong, UCLA professor of physics and spokesman for VERITAS’ international team of astronomers. Cosmic rays are charged subatomic particles, mostly protons, that zip through space at nearly the speed of light. They strike the Earth’s atmosphere violently and often, with the punch of a 98-mph fastball, but don’t do significant damage to humans because the atmosphere shields us. Still, astronomers wondered what natural forces could accelerate these cosmic rays to such high speeds. They suspected that the rays were created by supernovae (star explosions) and stellar winds, but they couldn’t prove it because they lacked an instrument sensitive enough to see it. The Very Energetic Radiation Imaging Telescope Array System, VERITAS, at Fred Lawrence Whipple Observatory in southern Arizona. Along came the VERITAS telescopes, which have found evidence for the interactions of high-energy cosmic rays in the starburst galaxy M82, also known as the “Cigar Galaxy.” M82 sits about 2 million light-years from Earth, in the direction of the Ursa Major constellation. VERITAS’ observations over a two-year period strongly support the theory that a starburst galaxy such as M82 — with its exceptionally high level of star formation — produces a high density of cosmic rays at a level greatly exceeding the density in our own galaxy, the Milky Way. This information didn’t come easily. VERITAS couldn’t detect M82’s cosmic rays directly because they were too far away, locked inside the Cigar Galaxy. Instead, VERITAS looked for clues to the presence of cosmic rays in the form of gamma rays, which are the most energetic form of light. Created when cosmic rays interact with interstellar gas and radiation within M82, gamma rays can reach Earthbound detectors, appearing as a shower of particles. 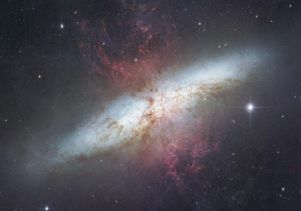 The starburst galaxy M82, also known as the “Cigar Galaxy,” sits about 2 million light-years from Earth, in the direction of the Ursa Major constellation. 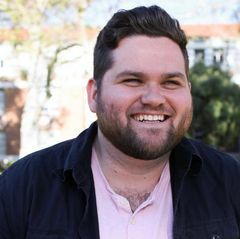 Ong and his UCLA colleagues — Associate Professor Vladimir Vassiliev, two postdoctoral researchers and several graduate students — are supported by the National Science Foundation for their work with VERITAS. 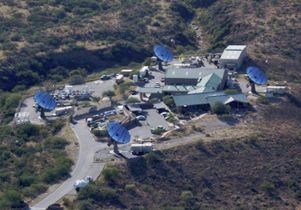 In addition to observing and analyzing the data, the UCLA scientists built various electronic components of the telescope array, which were fabricated here. The VERITAS collaboration comprises an international team of more than 100 scientists from 24 different institutions in the United States, Canada, the U.K. and Ireland. 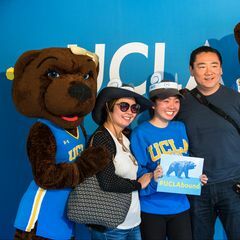 Many of the scientists log on to UCLA every day to retrieve data —Ong and his colleagues also developed much of the software required for the project and are responsible for storing all of the data from VERITAS in one huge archive on the UCLA campus. This discovery provides new proof that not all gamma rays are dependent upon the existence of a black hole. Prior to 2009, all of the known VHE (very high energy) gamma-ray sources from outside of our galaxy were associated with active galaxies that are powered by matter falling into a supermassive black hole. As matter falls into the black hole, it gives off energy; scientists believe that some of the energy released acts as a supercharging force that accelerates particles to high speeds, creating cosmic rays. While our galaxy has a black hole, it’s not a very active one, said Ong. For more information on VERITAS, click here.